In late February 2019, we came across the first sample of fake bullion that was optimized to pass testing using electrical conductivity measurements (ECM). ECM testing machines are one of the most effective retail testing tools for high purity gold or silver bullion as they are affordable, easy to use and allow for testing of packaged bars in blister packs without opening the packaging. The bar in question was successfully sold to a pawn shop in Singapore after passing the ECM tests. Fake gold bars are usually made of gold-plated tungsten because the density of tungsten, which is 19.25 times that of water, is very similar to gold’s density of 19.30. This makes tungsten the most suitable metal to create counterfeit gold bars whose dimensions and weight are very close to gold. ECM testing machines have been very effective testing tools in detecting such tungsten bars because tungsten has a much lower conductivity compared to gold (18.52 vs 44.7 MS/m). Thus, as ECM testing machines have become more mainstream, it became easy to detect gold-plated tungsten bars. With the prevalence of ECM testing machines, counterfeiters are now optimizing fake gold bars to fool testers. These bars were made of about 90% copper which has a theoretical conductivity of 59.1 MS/m which is one of the few metals that has a higher conductivity than gold. By carefully mixing copper with other lower conductivity metals and impurities, it is easy to reproduce gold’s theoretical conductivity of around 44.7 and pass the ECM test. While this is a cause for concern, optimizing to pass ECM tests mean that the altered bars are physically twice as big as real gold bars of the same weight because copper is less dense, being about 9 times the density of water, compared to gold’s 19.3. These fake gold bars can easily be identified by people familiar with gold. Placing these gold-plated copper bars next to real gold bars would make it very obvious that these are fake gold bars. While retail customers crave certificates and packaging such packaging is often a hindrance to testing and a way for counterfeiters to easily sell their fake gold to unsuspecting victims because it is easier to falsify certificates and packaging than the gold itself. As the example above shows ECM optimized fake gold bars are easily identifiable as they would be about twice the size (half the density) of a real gold bar. 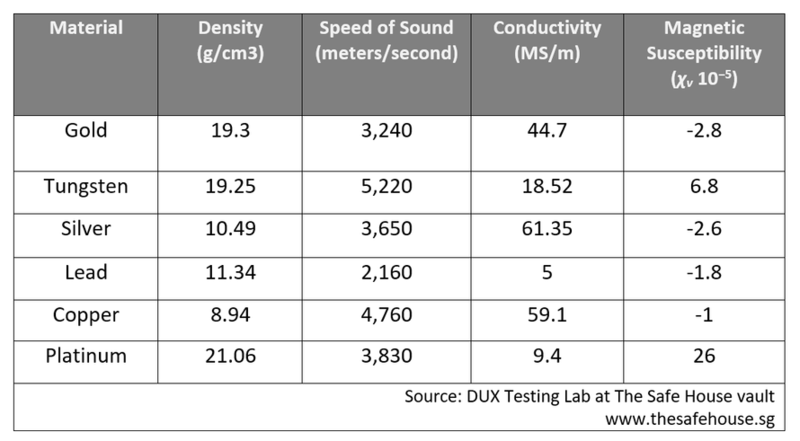 Besides testing for density and electrical conductivity, bars can also be tested with ultrasound (which measures the unique speed of sound traveling through a metal), magnets and x-ray spectrometers. While a bar might be optimized for one of these characteristics it is very difficult for single bar to pass multiple physical property tests and pretty much impossible to pass three or more tests as the chart below illustrates. For example: Tungsten is a good substitute for gold given the close similarity in density but is easily detected by ultrasound, as sound travels much faster though tungsten (5,220 vs 3,240 m/s). The presence of tungsten would also be easily detected using electrical conductivity tests, because tungsten is much less conductive than gold (18.52 vs 44.7 MS/m). It would also fail magnetic tests because gold repels rather than attracts magnets (-2.8 vs. 6.8 χv 10−5). The appearance of counterfeit gold bars optimized to pass electrical conductivity tests is not rendering ECM testing machines obsolete but it is a reminder that no single testing tool should be relied upon solely to authenticate bullion bars. A electrical conductivity test and a simple visual density test would have easily detected these counterfeit gold bars. Be wary of packaging as fake high-fidelity packaging has become a common occurrence to hide the shortcomings of fake gold bars.